P.L. Travers, who wrote the classic book series “Mary Poppins,” and whose life was revealed recently in the Disney film “Saving Mr. Banks,” was said to have lived a much more austere and tragedy-filled life than was indicated by that movie. She grew up with horrific poverty, moved often, her ignominious father died when she was seven, and her mother attempted suicide more than once. Nothing glamorous, nothing to make you envious of her early childhood, even if what developed out of her pain was one of the great and cherished pieces of writing of modern times. How very sad, to have your grandchildren say that you loved no one and that no one – including themselves, I assume – loved you. I don’t care how many wonderful, memorable books you have written, what other accomplishments you leave behind. A person who has this said of her is about as sad a person as I can think to define. That’s one of the ultimate sadnesses that there is. What makes you cry? 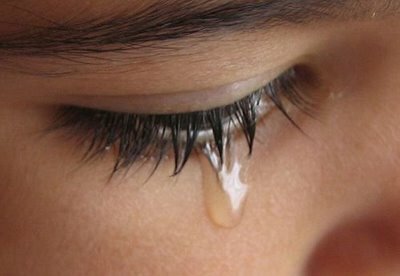 What is so sad in the world around you that you cannot help but shed a tear? What memories do you harbor in your soul of a childhood that wasn’t stellar, of parents who damaged you more than blessed you, of events that you wish you could erase and would rather not remember? We are all marked more or less by our tears and our pain, some so deeply that they never recover. Ms. Travers was obviously one of those who could not overcome the adversity of her childhood to enjoy an adulthood filled with love and warmth. Some people endure great hardship as children and yet find the strength and will to love and smile as much as they possibly can when they are adults. I don’t honestly know what makes one person able to overcome the trauma of a childhood filled with grief and another not. It’s a mystery. Perhaps it’s part of the greater mystery of God’s grace that touches some in one way and not others. I can only weep for those who, like P.L. Travers, were so handicapped by their misfortune that they not only endured their own damage but saw that damage carry on to future generations of their own family. One of the great consolations of Scripture is that Jesus promises to one day wipe away every tear, remove every vicious memory from our minds, and put into our hearts a glorious, uplifting song that we will sing for eternity, for those who are in a relationship with Him. Whatever past you wrestle with, whatever demons haunt you, one day you will walk free from all of it. One day you will understand that tears and crying and negative emotions are things of the past…forever. It’s called heaven, and some days it can’t come too soon for my liking.